Ever wondered how all different curries are distinguished from one another? Spoiler alert: it’s not just the color that sets them apart. Curry characteristics differ across Southeast Asia depending on region, as do they differ in our many western adaptations. Some of the factors that influence curry recipes are geographical – what local ingredients are available? Meanwhile, some are preference-based – for instance, we like handfuls of peanuts in our curry here in the west. Curries are also influenced by other curries! Here, most of us are familiar with Thai curries, having encountered the various varieties either out at restaurants or during home cooking ventures. 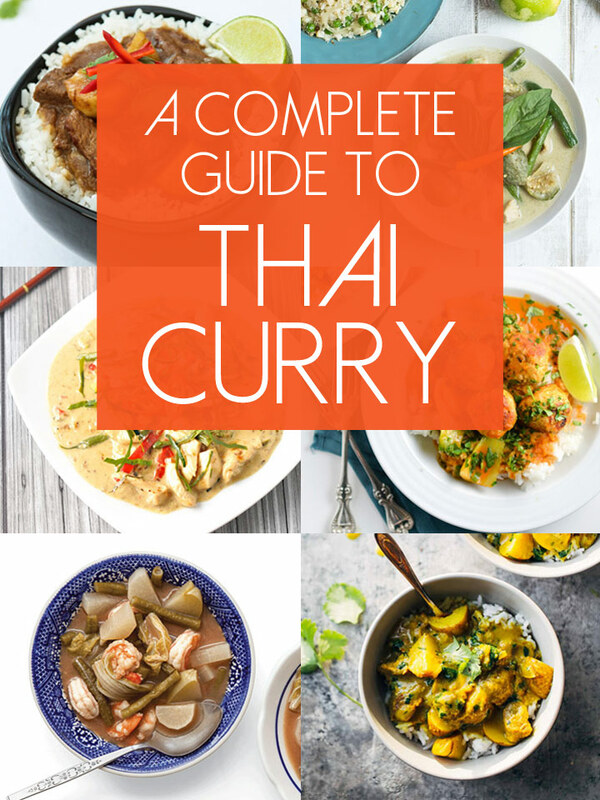 We offer a guide focusing in on Thai curries specifically, aiming to decode the curry rainbow one color at a time. Curry is a staple in Thailand, making a daily appearance in many homes, created with fresh and local vegetables. 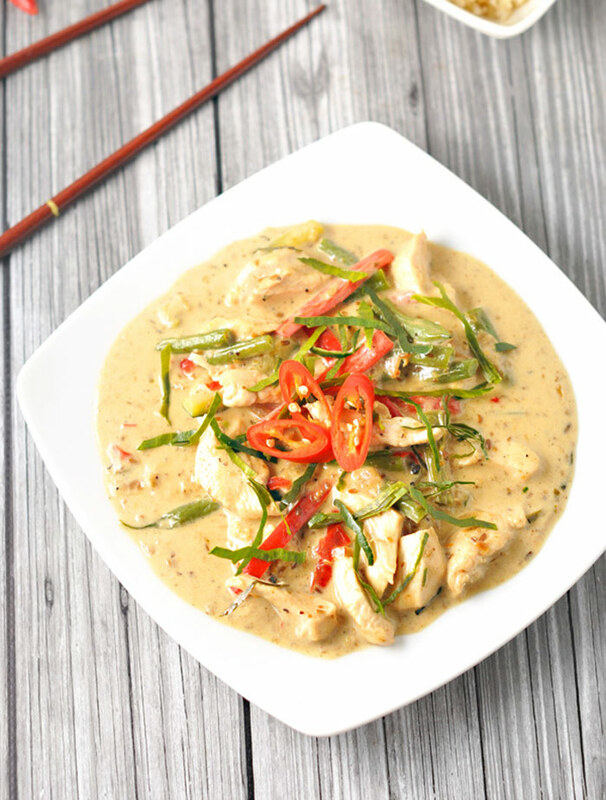 Thai curry dishes are generally soupy, combining either coconut milk or water with meat, vegetables, and the curry paste that the recipe is built upon. Any given curry is based on a unique paste, a blend of fresh and dried herbs and spices, all of which begin with some sort of chili pepper. All ingredients are pounded together vigorously with a mortar and pestle, thus yielding a paste. See the bottom section for instructions on making Thai curry with store-bought paste. Popular in Central Thailand, sour curry features a paste that consists of only five ingredients, and is also water-based – these two properties thus render it the simplest and the spiciest of all the curries. Water-based curries are often spicier than those based on coconut milk, as coconut fat alleviates some heat. The Paste: Thai sour curry paste consists of dried red chilies, shallots, sea salt, turmeric, and shrimp paste*. Typical Add-ins: The “sour” element comes from tamarind, and sometimes from the addition of other sour tropical fruits (some recipes include pineapple). 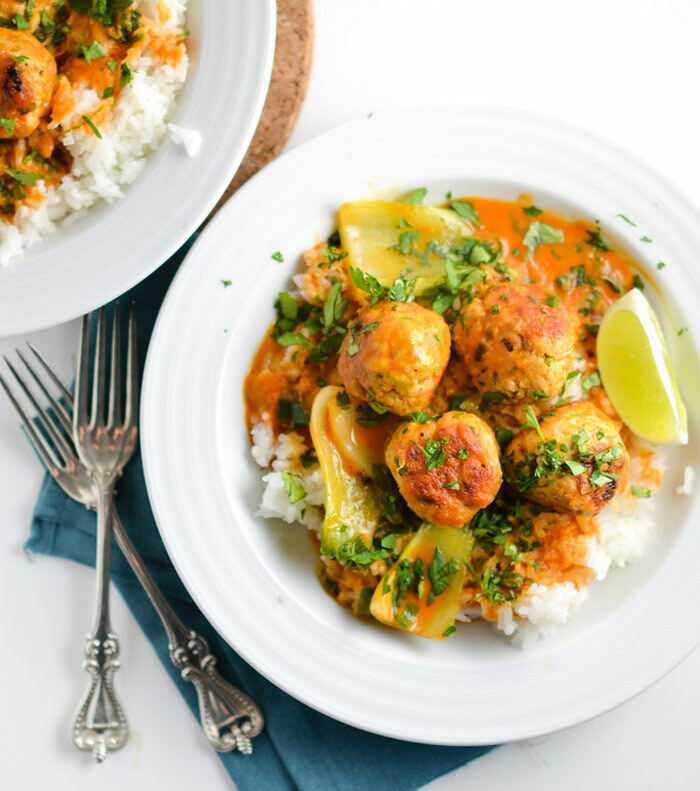 Sour curry is typically paired with fish or shrimp and locally available vegetables. *In vegetarian cooking, shrimp paste can be substituted with various salt-fermented soybean products such as yellow bean sauce. Also hailing in from Central Thailand, sweet and sort-of spicy green curry is the only variety with a paste of fresh thai chilies (as opposed to dried). It is often considered the most popular curry in Thailand, and is the most distinct from curries of other countries. The Paste: Thai green curry paste includes fresh green chilies, shallots, lemongrass, white pepper, coriander root, garlic, kaffir lime rind, shrimp paste, and sea salt. 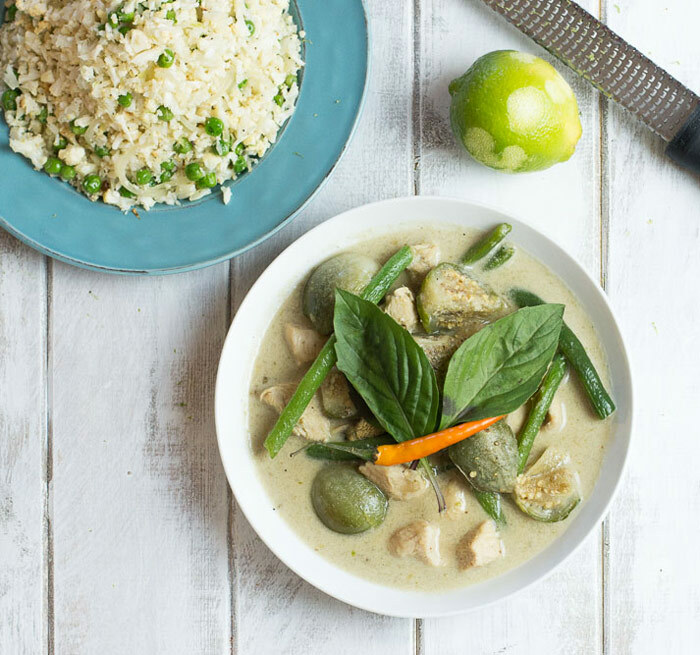 Typical Add-ins: With green curry comes green vegetables. The inclusion of green beans, sweet basil leaves or round green eggplant will add to the green hue. You might find these among bell peppers, onions, and other vegetables. As for the protein, it is served with either beef or chicken. Acquiring its color and spice from a generous amount of red chilies (we’re talking double-digits), red Thai curry paste is the most versatile of all the pastes, used in the widest range of dishes. Any variety of meat and vegetables can be simmered in the sauce. The Paste: Thai red curry paste contains dried long red chilies, cilantro root, coriander, cumin, garlic, shallots, kaffir lime rind, white peppercorn, lemongrass, shrimp paste, sea salt, and galangal*. Typical Add-ins: Red curry is prepared with chicken, duck, beef, shrimp, pork, etc. Commonly added vegetables include thai eggplant, thai basil, and bamboo shoots. *Galangal is also called “blue ginger” – it is a root that is similar to ginger in appearance, but distinctly different in taste. There are a few Thai versions of traditional Indian yellow curry, and they all contain lots and lots of turmeric, providing a golden hue. Yellow Thai curry is generally richer than other Thai curries and uses a mellow sweet and spicy paste. The Paste: Thai yellow curry paste includes turmeric, coriander, cumin, lemongrass, galangal, shrimp paste, dried red chilies, sea salt, ginger, garlic, and shallots. 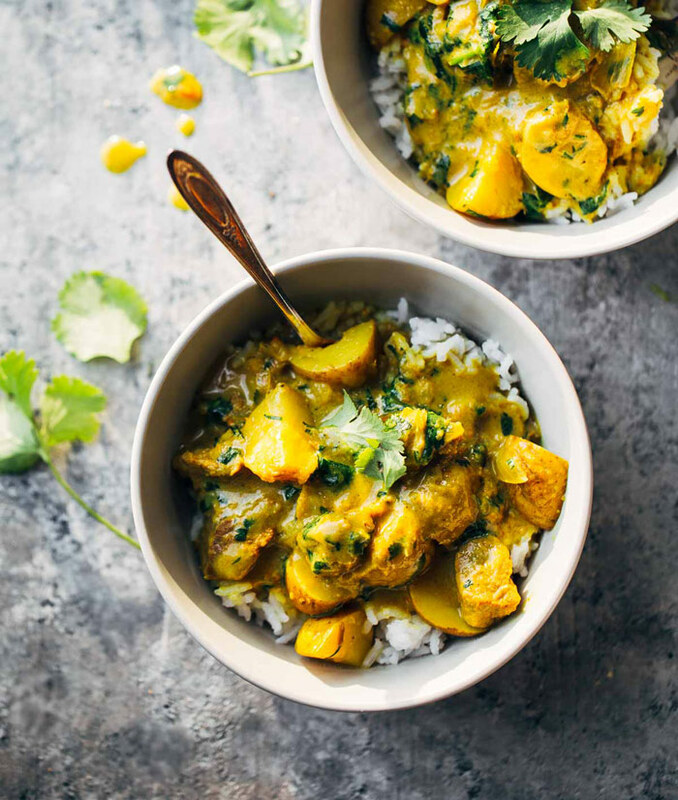 Typical Add-ins: Yellow curry is usually used in fish stews or combined with coconut milk, onion, potatoes, and chicken for Yellow Chicken Curry. A few renditions: Gold Curry is a spicier version of basic yellow curry; Elephant Curry is highly spicy and absent of coconut milk. Named for the island off of Malaysia’s west coast, Panang provides the basis for a richer, sweeter and drier curry. 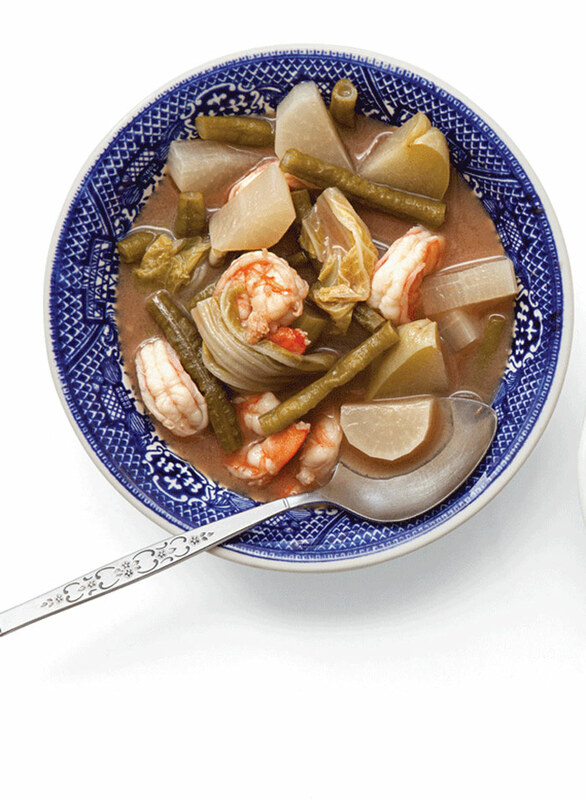 Less coconut milk is used than in red or green curry. Due to its thickness, panang curry can be (and is, generally) served on a plate, and is then topped with coconut cream. The Paste: Panang curry paste can include dried red long chilies, shallots, garlic, galangal, lemongrass, kaffir lime rind, coriander root, white pepper, salt and shrimp paste. Typical Add-ins: In Thailand, panang curry is most often prepared with beef, and airs on the side of hot and spicy. We like to add peanuts here in the west. One might also add in veggies such as green beans, peppers, or zucchini. 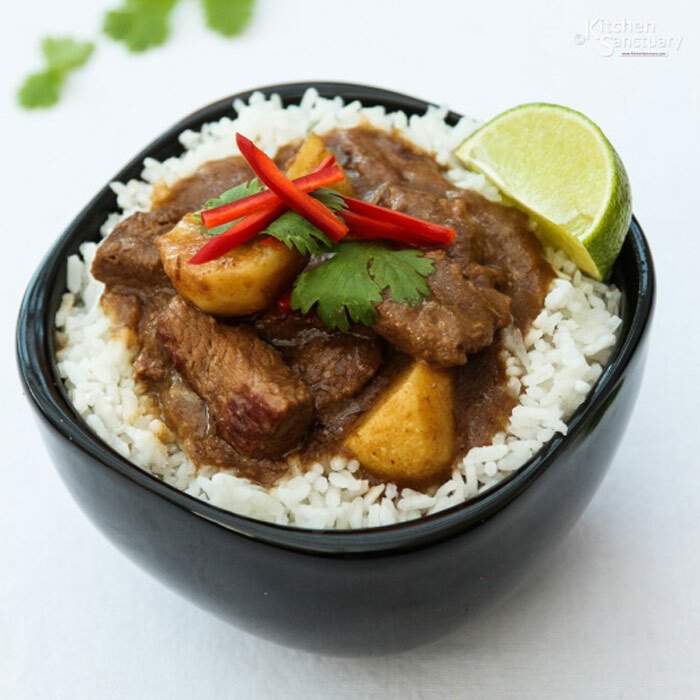 Massaman curry in unique among Thai curries, as it is an interpretation of a Persian dish, utilizing persian-influenced dried spices. Originating in the deep south of Thailand, it is thick and stew-like in texture, and mild in taste, slightly sweet with the taste of roasted spices. The Paste: Massaman curry paste combines dried red chilies, shallots, garlic, galangal, lemongrass, coriander, cumin, cloves, white pepper, salt, and shrimp paste. Typical Add-ins: The dish generally includes beef, potatoes, onions, peanuts, and whole spices such as cinnamon, white cardamom and nutmeg. Rather than immediately adding the paste into a pot with coconut milk, first saute the paste in oil for a few minutes in order to release flavors (it is also good to do this as usually the ingredients in curry paste are raw). Then, whisk in the coconut milk and simmer. All of these styles of curries are versatile and can be experimented with and adapted based on preferences, substituting different meats and vegetables. Let us know if you have any at-home curry tricks in the comments!